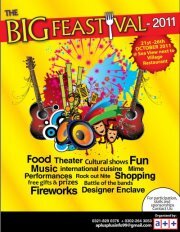 A++ in collaboration with DHA Services is pleased to bring "The Big Feast-ival 2011" (21st October - 26th October, 2011) @ Sea View next to Village Restaurant / Cineplex. This Feast-ival is first of its kind by A++. ** Entry Passes will be available 1 week before the event. This will be a best opportunity for all individuals to market a large segment of population under one roof.